Are you familiar with the Langues-de-Chat, or what Americans call “Cat’s Tongues”? If you are not, you will surely want to be. This is a long, thin French cookie that is light, crisp and slightly sweet. As its name states, it is the shape of a cat’s tongue. It belongs to the category “Petit fours secs” or “dry petit fours”, as opposed to the smaller versions of pastries involving butter creams or pastry creams. The langues-de-chat dates back to the 17th century where refined white sugar was just coming onto the baking scene. It was a staple among the wealthy class of Northern Europe. You would see this French cookie served with fine liqueurs or sparkling wines and would be a lovely addition to a dessert table. What makes this cookie unique is its versatility. It is not meant to be gobbled up like a chocolate chip cookie, but rather it acts as an accompaniment to such desserts as mousse, ice cream or just a simple cup of tea or coffee. It is more of a “nibble” than a full fledged dessert. The ingredients are household staples, but the trick is in the execution of this piped beauty. It is a matter of practice and patience to get the shapes to be consistent. And to mix it up a little bit, you can change the flavor of the cookie – swap vanilla for either lemon zest, orange zest, cardamom, or even nutmeg. Want to try this authentic French cookie? 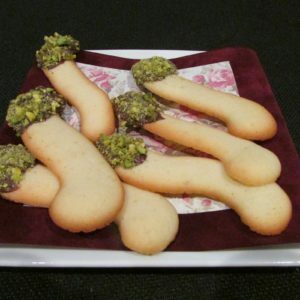 I hand-dip each one in bittersweet chocolate and sprinkle them with chopped green pistachios. And if you have a nut allergy, no worries. 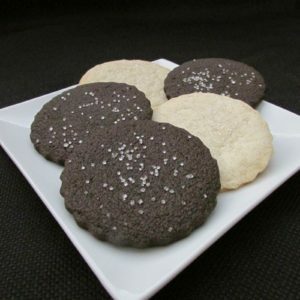 I can substitute various colors of nonpareils or sprinkles. Trust me…..sit with you cup of tea/coffee, close your eyes and taste this lovely French treat. You’ll swear you’re in a French cafe with nothing else to do but enjoy a moment away from the busyness of your day.